Massachusetts Institute of Technology researchers have found a new way to make cathodes for lithium batteries, offering improvements in the amount of power for both a given weight and a given volume. Molecular diagram shows the structure of molybdenum sulfide, one of the materials used to create the new kind of cathode for lithium-sulfur batteries. Image Credit MIT. Click image for the largest view. The research has been described in a paper published the journal Nature Energy, by Ju Li, an MIT professor of nuclear science and engineering and of materials science and engineering; Weijiang Xue, an MIT postdoc; and 13 others. The cathodes of such batteries are usually made in one of two ways, known as intercalation types or conversion types. Intercalation types, which use compounds such as lithium cobalt oxide, provide a high volumetric energy density – packing a lot of punch per volume because of their high densities. These cathodes can maintain their structure and dimensions while incorporating lithium atoms into their crystalline structure. 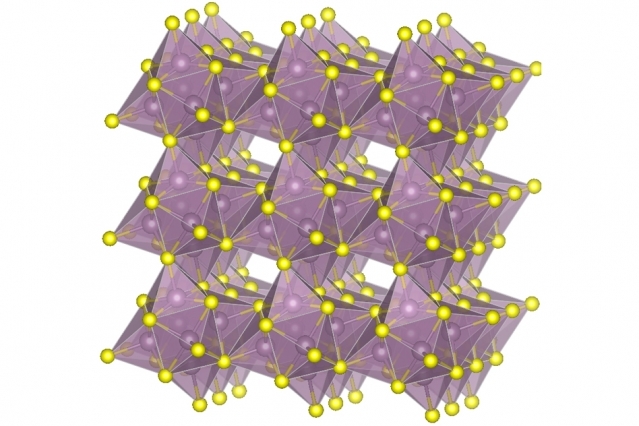 The other cathode approach, called the conversion type, uses sulfur that gets transformed structurally and is even temporarily dissolved in the electrolyte. “Theoretically, these [batteries] have very good gravimetric energy density,” Li said. “But the volumetric density is low,” partly because they tend to require a lot of extra materials, including an excess of electrolyte and carbon, used to provide conductivity. In their new hybrid system, the researchers have managed to combine the two approaches into a new cathode that incorporates both a type of molybdenum sulfide called Chevrel-phase, and pure sulfur, which together appear to provide the best aspects of both. They used particles of the two materials and compressed them to make the solid cathode. “It is like the primer and TNT in an explosive, one fast-acting, and one with higher energy per weight,” Li said. With further work, he said, “we think we can get to 400 watt-hours per kilogram and 700 watt-hours per liter,” with that latter figure equaling that of lithium-ion. Already, the team has gone a step further than many laboratory experiments aimed at developing a large-scale battery prototype: Instead of testing small coin cells with capacities of only several milliamp-hours, they have produced a three-layer pouch cell (a standard subunit in batteries for products such as electric vehicles) with a capacity of more than 1,000 milliamp-hours. This is comparable to some commercial batteries, indicating that the new device does match its predicted characteristics. So far, the new cell can’t quite live up to the longevity of lithium-ion batteries in terms of the number of charge-discharge cycles it can go through before losing too much power to be useful. But that limitation is “not the cathode’s problem”; it has to do with the overall cell design, and “we’re working on that,” Li said. Even in its present early form, he said, “this may be useful for some niche applications, like a drone with long range,” where both weight and volume matter more than longevity. “I think this is a new arena for research,” Li said. This research probably has legs because of all the advantages and little in the way of revolution. This may prove to be readily adoptable technology across many manufacturing processes. It will be welcome indeed.